Nowadays, the tradition still exists even though modern medical technology has proven the belief wrong. 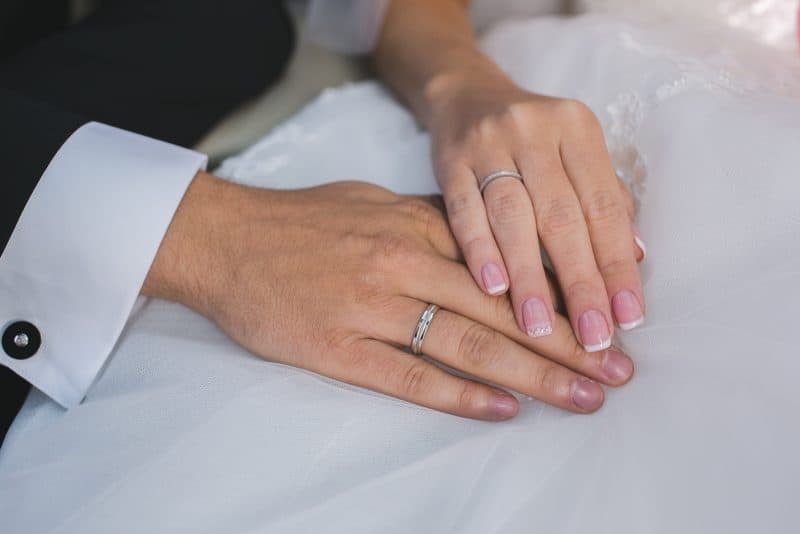 Another tradition is, after the ceremony, women transfer their engagement ring from the left hand to their right so they can wear the wedding ring on the left finger. These can also sometimes come in bridal sets, which consist of engagement rings and wedding bands. The bands and rings match perfectly and can be both worn together or separately. There are many styles of these bridal sets from interlocking bands, matching designs and more. Usually there will be a solitaire with or without accents on one ring and a band with or without stones on another. A matching set is beautiful and there are many styles to choose from. When choosing between a set and a solo, think of the practicality. Do you want to wear two rings? Does a wedding ring set match your personal style or lifestyle? Think about everyday wear and think of which type of design would fit you. Wedding bands, wedding rings, and bridal jewelry sets are not only pieces of jewelry, but also significant symbols of love and commitment. When choosing wedding bands and other bridal jewelry for yourself or your loved one, look at many different types and styles. Find wedding bands and rings that you will cherish forever because the rings are not only a fashion statement, but also a message of love and a promise that should be kept for a lifetime.